Tom Neumann is ICESat-2’s deputy project scientist, making sure the mission will gather the best possible information for the scientific community. He’s quite familiar with ice, having traversed Antarctica on a five-month research expedition and drilled cores in the Greenland ice sheet. There are many smart people on the ICESat-2 team who want to figure out how to make things work – which is one of the most enjoyable parts of the job, he said. 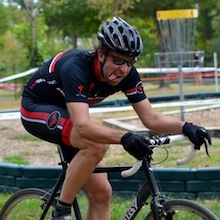 Beyond work, Tom races bikes and plays guitar in a band with other ice scientists.